We are excited to announce the release of Lumberyard Beta 1.5, which you can now download here. This release contains over 210 new improvements, fixes, and features. One of our teams’ tenets is to move fast and give customers early access to the technology we are building. This gives you the opportunity to give us feedback at the earliest stages of development, which we believe will dramatically improve and focus our deliveries from release to release. We think that great technology isn’t developed in a top secret, airtight room for months or years at a time – the best game tools and systems come out of a tight feedback loop between the people using our technology and our engineers building that technology. The first, the Particle Editor, is an example of a mature system in Preview, heading for general availability towards the end of the year. We’ve already gotten many months of great feedback on the particle editor from game teams and effects artists, especially in areas around improving iteration speed and optimizing particle systems. Lumberyard Beta 1.5 includes custom attribute panels so you can drag and drop the attributes you use the most into a UI panel, and save that setup for easy re-use or sharing amongst your team. 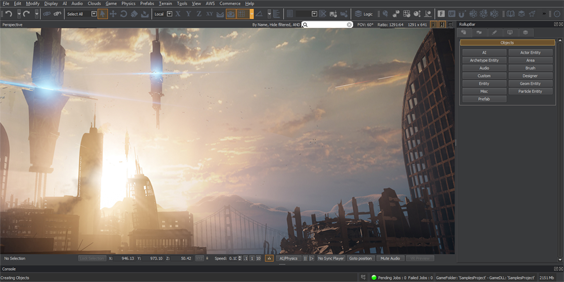 Because we believe great performance is critical to any game, the particle editor’s new level of detail system gives you finite control over optimizing visual effects based on their distance to your game’s camera. You can modify emitters on a per-attribute level and seamlessly blend between the levels of detail you specify. For example, you can create stunning effects for your hero characters as they are close to the camera, but more performant effects for characters in the distance. If you have other methods of optimization you’d like to see in our particle editor, let us know. The second, the Component Entity system, is an example of a system in the middle of its life as a Preview. The new Component Entity system provides a modular and more intuitive method for constructing game and engine elements, so your team can build faster and create more complex behaviors. The Component Entity system employs reflection, serialization, and messaging using the Lumberyard event bus (EBus) to automatically expose features of components to designers – no additional engineering required. The system lets you drag-and-drop and edit components in the Lumberyard Editor, and also supports fully cascading prefabs, which we call slices. This month, you will find a new suite of pre-made components to help you create gameplay faster, including components that cover primitive shapes (you can create triggers, colliders, volumes, and other spatial features your game needs in a few clicks), skinned meshes, audio, ragdolls, and character physics. One popular customer request was the ability to tag and filter components – to better organize a large toolbox of components – so we delivered that this month too. Our team plans to improve the Component Entity UX and grow our overall component suite using your feedback. If you have ideas on what kind of components you’d like to see next, let us know. Finally, a new system makes its Preview debut in this release – the Lumberyard Asset Builder SDK. Many of our customers build custom tools that require specialized assets types. Often times, these tools help developers differentiate their games, or enable their team of experts to work faster. For example, one developer we talked to uses .EPS from Adobe Illustrator to quickly generate sidescroller levels. This SDK enables you to use the Asset Processor to track, reload, automatically rebuild, and process any assets your game or in-house tools require. The Lumberyard tools team would love to hear what specialized asset formats your team relies on, and how the Asset Builder SDK is working for those assets. We are excited to get your feedback on our Preview systems. To make this easy, we’ve set up a new section in our forums dedicated to Preview features, so let us know what you think. Lumberyard Beta 1.5 contains many other updates as well, including support for OSVR, performance improvements to the Asset Processor, support for Clang on Android, a VRAM profiler so you can more easily optimize graphics for your game, and more. For details on everything new in the Lumberyard Beta 1.5 release, check out the full release notes here. It’s still day one on Lumberyard, and you will see sneak peaks of more Preview technology this year. In the coming releases, we will deliver Linux support for the Lumberyard multiplayer server, which combined with Amazon GameLift’s new Linux support can save you up to 45% of your EC2 infrastructure costs for session-based multiplayer games; a unified Asset Browser so you can browse, tag, search, and monitor all of your assets from a single location in the editor; Visual Studio 2015 support… and some fun surprises that we’re not quite ready to reveal yet.